Where in the world will you find a 300 pound terrapin? If you guessed at the University of Maryland’s football you would be correct. Located on the field is a statue of the university’s mascot, Testudo. Before every home game players touch the statue for good luck. The home of the Terps is the second stadium that the team has called home. For over two decades the football team played at a 5,000 seat facility that opened in 1923. 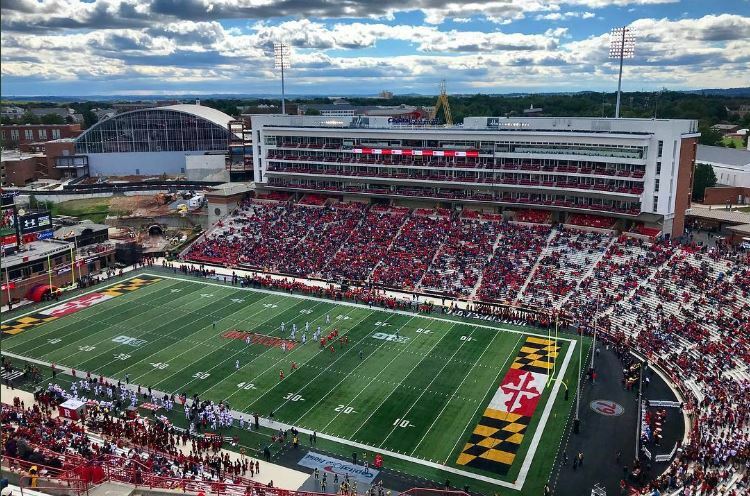 Due to its small size,the University of Maryland decided to build a new state of the art football complex for the Terrapins in the late 1940s. Constructed in 1950, the new opened on September 30, 1950 when the Terrapins played Navy before a huge crowd of over 43,000. The stadium was named after Harry Cliff Byrd, President of the University of Maryland from 1935 to 1954. When it opened in 1950, Byrd Stadium had a capacity of 34,860 but temporary bleachers often led to huge crowds. A single tier grandstand in a horseshoe shape enclosed the gridiron. By the late 1980s, Maryland decided to expand Byrd Stadium. After the 1990 season, the Tyson Tower, a five tier building containing the press box and luxury suites was constructed on the south side of the stadium. By the 1996 season, a 12,000 seat upper deck was added bringing the seating capacity to 48,000. In 2006 a $50 million expansion project was approved to continue to enlarge Byrd Stadium. Completed by the 2008 season, this project added 60 luxury suites, a 150 seat president deck, 560 covered seats and 2,000 seats. In August 2006, the University of Maryland sold the naming rights to Chevy Chase Bank (acquired by Capital One) for $20 million over 25 years. Prior to the start of the 2012 season, the grass field was replaced with Fieldturf. In December 2015 Byrd Stadium was renamed Maryland Stadium after disagreements regarding the stadium being named after Harry Cliff Byrd. Future plans call for 8,000 seats to be added to the west side of the stadium.